I am afraid of surgery but heard that there are some nonsurgical ways to remove unwanted fat. Can you tell me the best way to achieve my goals of fat removal without surgery? There are nonsurgical ways to removed unwanted body fat but I must tell you right off the bat that the quickest and most predictable way to achieve this is with a surgical procedure such as liposuction or a tummy tuck, for example. The two most commonly non-surgical ways to remove fat include freezing it (e.g. CoolSculpting®) or heating it with a laser (e.g. SculpSure®). These methods can be successfully used in patients who prefer multiple nonsurgical treatments but there are differences between the two that you should be aware of. SculpSure® treatments take about 25 minutes per area and approximately 20% of your excess fatty layer will go with each treatment, while the fat freezing treatments take 35-60 minutes per area – most patients require 2-3 treatments to achieve the results they desire. SculpSure® is a well-tolerated treatment with little discomfort, whereas, with fat freezing, post-treatment massage is required which can be uncomfortable. The safety profile is with better with the SculpSure®. Side effects are mild and temporary whereas with fat freezing, common side effects are numbness, bruising and itching, as well as delayed onset pain, hernias and even paradoxical fatty hyperplasia (a thickening of the fatty layer which requires liposuction to fix it). With the fat freezing, unevenness in the treatment areas has been reported whereas, with SculpSure®, the feathering of heat provides a more natural looking result. And finally, patient satisfaction is high with both procedures but according to a few studies, better with the SculpSure®, 83-100% patient satisfaction, compared to 73-100% with fat freezing techniques. All SculpSure® procedures at our office are performed by our Physician’s Assistant, Crystal Osborn. 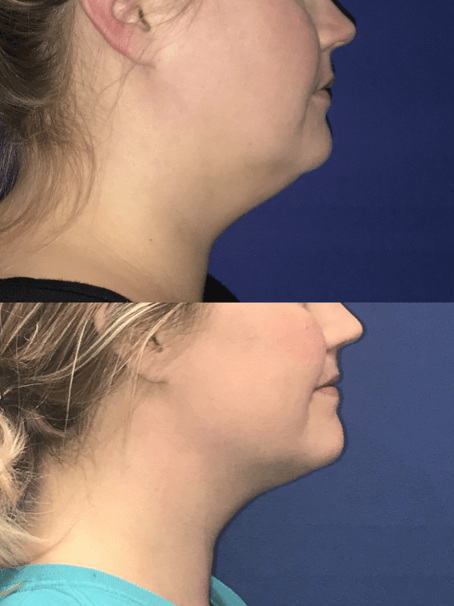 29 year old female before and after three SculpSure® treatments of her neck. Actual patient of Crystal Osborn, PA, your results may vary. 43 year old female, before and after a SculpSure® treatment of the love handle areas. Actual patient of Crystal Osborn, PA, your results may vary. If you have any specific questions about cosmetic procedures, your best bet would be to see a qualified plastic surgeon to review your options. Please feel free to contact our office at 949-888-9700 to set up an appointment with Dr. Bunkis or our PA, Crystal Osborn; you can also check out our website at www.orangecountyplasticsurgery.com to see further examples of similar patients.